Retrieved data can be downloaded in text format. However, not all the data are provided. Note that only one datum is available for specified elements, for example, only [Fe I/H] appears in the data even if [Fe II/H] is also available. We are planning to include all the available data in the database, together with other specified quantities and coordinates. popup windows on the plot panels. There are minor problems in popup windows when the data are plotted using the data retrieval subsystem. The popup windows provide information on data and references, but references are not displayed for Milky Way stars. This problem will be fixed in the future update. 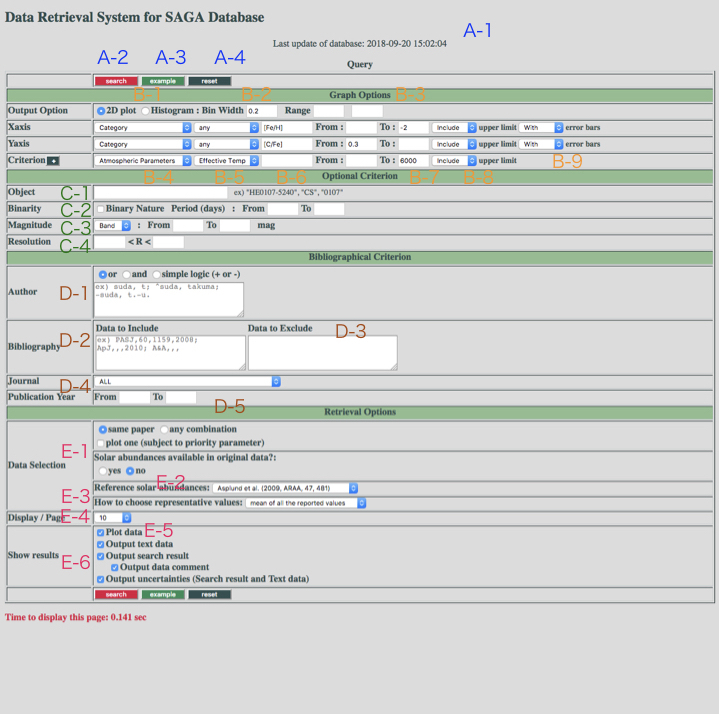 In the current version, it takes long time to plot data using the data retrieval subsystem. In particular, the time to plot figures is unexpectedly long when the replot button is pressed. We expect to reduce time for this process. The RV data are available for only one record for each object in each paper. We have all the records of RV monitoring for individual objects in the database, but we provide only the first record of monitoring through the web site for a technical reason. We are planning to fix this problem in future updates. We have taken into account the difference in adopted solar abundances, but not all the papers provide information on them. In such cases, we use Grevesse et al. (1996) as reference solar abundances. The list of data without the information on solar abundances will be uploaded later. The database retrieval system creates the figures using gnuplot version 4.2.6. Therefore, the script downloaded from the server works with this version or later (maybe incompatible with version 4.0 and 3.X). Object has sometimes two or more identifiers. For example, “CS31062-012” has other object names, “G268-32” and “LP706-7”. The SAGA database uses one ID for one object. In this case, you cannot search with the object name neither “G268-32” nor “LP706-7” in the data retrieval subsystem. In the database, the names of objects are used according to the following priority by the catalogue name. You can check the object IDs used in the database from the links in the list. Abundance conversion between log-e, [X/H], and [X/Fe] is done by using solar chemical composition based on the adopted solar abundances in the literature. If they are not available, we use photospheric abundances in Table 1 of Grevesse et al. (1996, ASPC, 99, 117). 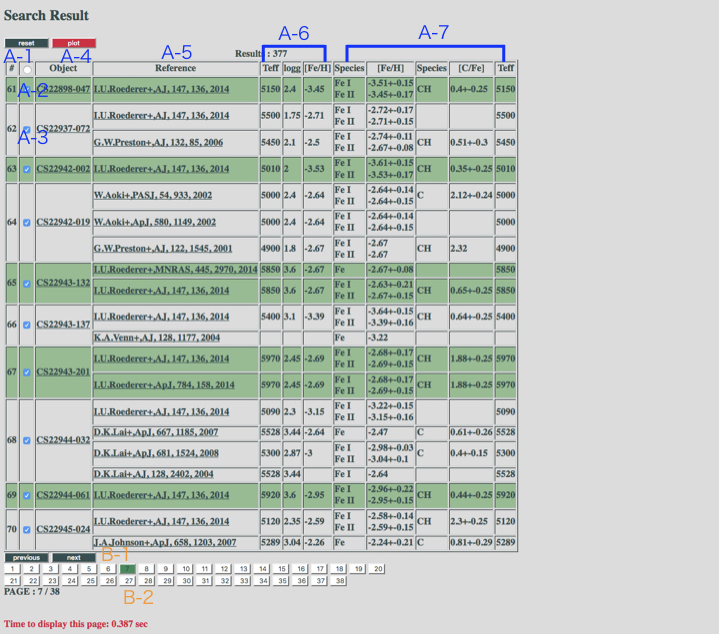 This tutorial explains the meanings of the options and columns displayed on the retrieval subsystem and shows how it works. This works when Histogram option in B-1 is chosen. B-6: Quantity in text format. [Fe/H], [C/Fe], [C/N], … any combinations of [X/Y ] are supported. B-7: Allowed range for specified quantity. Set blank if unset. B-8: Options to choose if the data with upper limit is included or excluded. C-1: Search by object name. Names such as “HE0107-5240”, “CS”, and “0107” are allowed. C-2: Subtract binary stars with the specified range of binary period. C-3: Criterion for the range of photometric magnitude for selected photometric band. C-4: Criterion for the resolution power, R.
Family Name, Given Name or Initial Middle Name or Initial: Given Name and Middle Name can be omitted. First author search by “^”. All the names and initials are case insensitive. Given name and middle name can be connected by hyphen. Format must be “Journal, Volume, Page, Year”. Any criterions can be omitted. D-4: Criterion to choose the journal. D-5: Criterion for the published year of original journal. E-1: Cross search option. Choose if the combination of data across papers is allowed or not. plot one: plot only one data if more than one data are available with the same paper option. The data selection is subject to the formula that defines the priority of the data. E-2: If yes, select data only from the abundances with the adopted solar abundances are provided in the original papers. Otherwise, all the data are searchable. E-3: Reference solar abundances. Abundances are converted using the reference solar abundances. E-4: How to choose the representative values if two or more data are available from the literature. subject to priority parameter: data to plot is selected by the criteria. E-5: Number of display per result page. A-1: Plotted data are automatically classified into categories according to the following criteria. EMP: stars with [Fe/H] ≤ -2.5. Although the value of [Fe/H] depends on the observations, it is simply taken from the data in the most recent published paper, the largest resolution for observing set ups, and the smallest error bars. Fe I is preferably adopted for identical paper. C-rich: stars with [C/Fe] ≥ 0.7. The selection condition of the data is the same as for EMP. “CEMP” means “C-rich” and “EMP”. RGB: stars with Teff ≤ 6000 K and log g ≤ 3.5. Otherwise, the star is classified as “MS”. 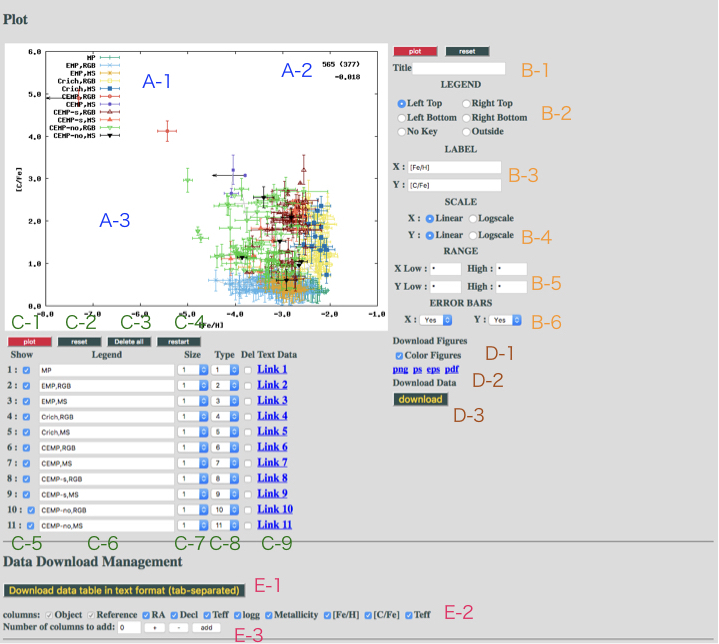 CEMP-s: stars that satisfy C-rich and EMP criteria and [Ba/Fe] ≥ 0.5. CEMP-no: stars that satisfy C-rich and EMP criteria and [Ba/Fe] < 0.5. A-2: Number of plotted data (top) and Pearson coefficient for plotted data (bottom). In calculating the coefficient, data with upper limits are excluded. A-3: Arrows show the upper limits for derived values. A-4: Panel is the clickable map. Each plotted data has a link to the page to see more information on the selected object. B-3: Option to set labels for X- and Y-axis. B-5: Option to set the range of values. Use “*” for automatic scale. B-6: Option to Include or exclude error bars on the diagram. D-3: Button to download all the data and script to reproduce the figure. A-6: Metallicity, Effective temperature, and Surface gravity of the object adopted by the paper. B-2: Buttons to change the page. The current page is shown by the green button.